David Tennant stars as an ambitious cabinet minister, Aiden Hoynes, who makes an ill advised play for the party leadership only to see his wife step into the ensuing void, in The Politician’s Husband. This three-part show originally shown on BBC Two in the UK is now available for streaming on Netflix. As the series opens Hoynes and his wife Freya Gardner, a wonderfully impressive Emily Watson, are the golden couple of British politics. Judging the time is right to challenge the Prime Minister – in the sort of internal party politics that we don’t see in the US, Hoynes is instead back stabbed by his best friend and fellow member of parliament Bruce Babbish leading to a cabinet reshuffle that lands Freya in the inner circle at the expense of her husband. Writer Paula Milne has an impressive pedigree as a screenwriter having penned such excellent shows as Second Sight, which brought Clive Owen to the attention of television viewers and The Politician’s Wife that featured Trevor Eve and Juliet Stevenson. Despite sharing a similar name there is no connection between The Politician’s Wife and The Politician’s Husband other than the superior writing and performances. 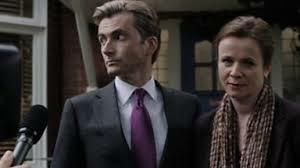 For Tennant there’s a certain curse that comes with having played the tenth Doctor in Doctor Who. The likes of Jon Pertwee and Tom Baker, both extremely capable actors, were never able to shake the association with the character and indeed at times they embraced it after moving on from the show. Similarly to Pertwee and Baker, Tennant was a relative unknown in terms of public perception prior to becoming the tenth Doctor with his appearance as Barty Crouch Jr. in Harry Potter and the Goblet of Fire occurring five months after his debut as the then latest Doctor. Unlike Pertwee and Baker however, Tennant has attacked his post-Who career with a tremendous gusto, notably and initially as former Manchester United assistant manager Jimmy Murphy in the drama United along with a large portfolio of voice work. This past year Tennant has taken the lead in four high profile productions in Broadchurch, Spies of Warsaw, The Escape Artist and The Politician’s Husband and to the actor’s credit each is a quality piece of work. Watson is one of those actresses that somehow get lost in the discussion of who is considered one of the “best” in the business and yet she turns in brilliant performances on a consistent basis. The aforementioned Stevenson, Rachel Weisz, Blair Brown, Gina McKee, Gillian Anderson and others fill my personal list of favorites, but the more I watch Watson the more I’m inclined to actively seek out her performances. Here there’s an early bedroom scene, that I’m sure has a lot to do with Milne as the writer and director Simon Cellan Jones, but the two-time Academy Award nominee just nails it with a combination of comfort and control that is in retrospect rather prescient. Watson’s rapport with Tennant is palpable and there is a genuine level of chemistry between the actors that adds a nice layer to the production. Fans of The West Wing will have already noticed the character names of Hoynes, Gardner and Babbish and Brock, Lyman, Moss and Bailey are also around as Milne reportedly paid homage to the show with her choices. Throw in references to the real world, current events and people and The Politician’s Husband is highly recommended.